Traton Homes recently announced that it has begun construction on 17 homes in Mountain Oaks, an existing community of single-family homes in Kennesaw. 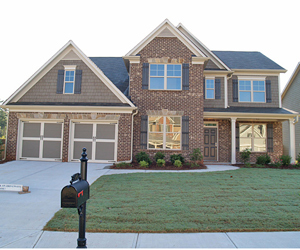 Anyone looking for new, luxurious Cobb County housing should not miss this opportunity to secure an affordable home. New homebuyers can select from 10 floorplans priced from the low $200,000s that range in size from 2,000 to 3,100 square feet. Each Craftsman-style home features brick, cedar shake and/or stacked-stone fronts with architectural detailing. One of the newer available plans is the Innsbruck, a four-bedroom, three-bath home with a two-car garage. Buyers will love the open design of the floorplan that includes a spacious two-story family room with a fireplace. This home is perfect for entertaining and features a large kitchen and breakfast area as well as separate dining and living rooms. Upstairs, a master bedroom with an oversized walk-in closet and spa-like bath is the perfect retreat after a long day. For buyers who like to customize their homes, the fourth bedroom can be turned into a library and the dining room can be used as a home office. The Mountain Oaks community provides residents with easy access to Cobb Parkway and Barrett Parkway, meaning that great shopping, entertainment and dining destinations are mere minutes away. Children in the community will attend wonderful schools such as Hayes Elementary, Pine Mountain Middle and Kennesaw Mountain High. Traton Homes website for more information on Mountain Oaks.